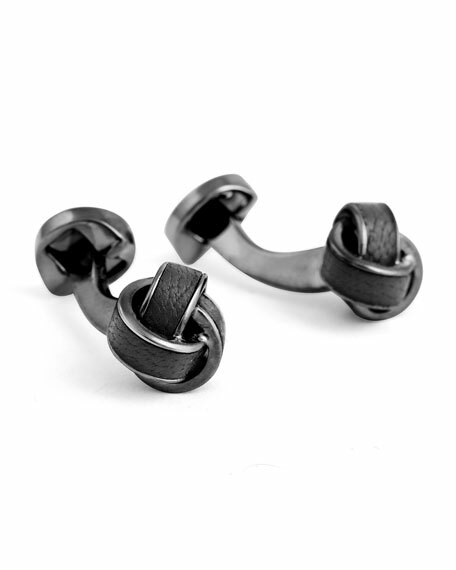 Gunmetal-plated brass with twisted black leather inlay. Semi-round front forms knotted motif. "Now with over 500 shops and 7,000 employees worldwide, the Ermenegildo Zegna Group started in Northern Italy with the dream and passion of one man. The company was founded in 1910 by Ermenegildo Zegna. At the age of 18 he founded the Lanificio Zegna (wool mill) and what was to become one of Italy's best known dynamic family business. He had a dream that he would make, in his own words, "the most beautiful fabrics in the world." Each generation of the family has been involved in consolidating Ermenegildo Zegna's vision, ensuring that the name Zegna remains relevant. In 1972 it launched its Made to Measure service. In 1980 Zegna opened its first boutique in Paris. This was followed by shops in London in 1983 and Milan in 1985. When opened its boutique at the Palace Hotel, Beijing in 1991, it was the first western luxury menswear brand to open a boutique in China, in line with its strategy of entering emerging markets early.